First thing up this morning I put in a call to the Granite Rock RV Park up in Kingsland to get our site number. That way we can just pull right in tomorrow and get parked without stopping by the office which is a separate entrance. 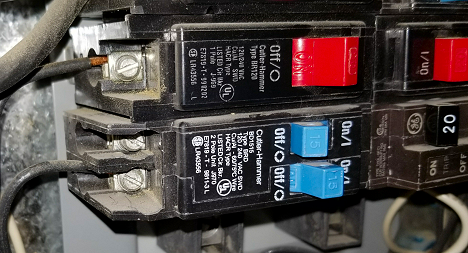 Then I swapped over the refrigerator circuit breaker from the bad breaker to the spare one under the bed. 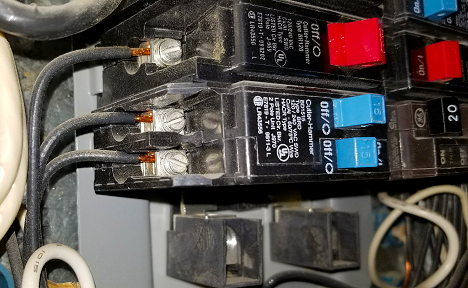 There was a wire already connected to the bottom breaker that I planned to use, but I assumed it wasn’t really connected to anything since that breaker has always been off all these years and everything still works. So I just disconnected the bottom wire and pushed it out of the way, and then moved the top wire down. Easy peasy and now I can remove the outside extension cord that I was using to power the fridge. 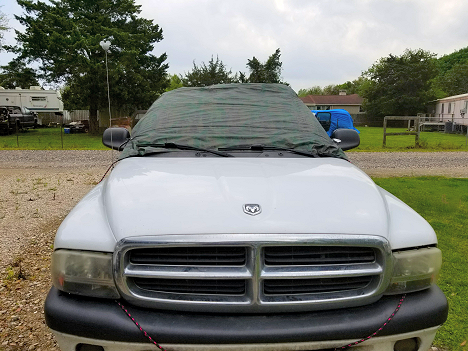 I spent the late morning and the rest of the afternoon washing and waxing the rig, finishing the wheels/tires, topping off the coolant with my green antifreeze that came in yesterday, and then finishing up by doing a trial install of my ‘Just In Case’ windshield cover to keep off the oil leakage that I’m hoping I won’t have. We went ahead last night and booked the 3 extra-charge excursions that we had picked out. And as we said, there’s not a Hike, Bike, or Hill in the bunch. We’ve still got a couple of tours that we’re looking at in London, but we’re holding off until we have a handle on how long we’re actually staying, i.e. the initial four days, or the seven days if we extend. So we’ll see. Wrapping up the afternoon we drove over to Pho20 for pho, salad, and shrimp rolls, our usual great meal. Then it was on down the Interstate for the Kroger’s for a few things, and finally a quick stop by the storage room to drop off the pressure washer and pick up the BrakeBuddy for tomorrow’s trip. We’ll head out tomorrow morning between 8:30 and 9am, depending on what the traffic looks like on SigAlert. Our first stop will be at the Buc-ee’s in Katy for coffee and breakfast kolaches about 70 miles along the way. I should also know by then whether or not my oil leak problem is fixed. Fingers crossed. Then we’ll make a second stop at the Buc-ee’s in Bastrop (sensing a pattern here? )about 170 miles along, with about 90 more miles to go until Kingsland. I figure the 260 miles will take us about 6 hours, due to all the non-Interstate roads, and also making our way around the bottom of Austin, always a mess no matter when or how you go. Really looking forward to seeing everyone. Finishing up with some more Van Gogh stuff, here’s a great version of Don McLean’s Starry, Starry Night, illustrated with Van Gogh’s paintings. And also an interesting video on “15 Things You Didn’t Know About Van Gogh”. And there were actually a couple that I didn’t know. Check it out.